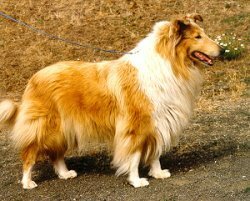 Kings Valley Collies has a successful history of training collies as service dogs. 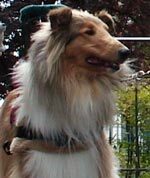 The stories that follow are wonderful examples of how a collie can assist a person who has difficulty with stability and mobility. We’ve shared our most recent stories at the top; scroll down to see stories about all the dogs we’ve trained. And be sure to check back regularly for our latest success stories! 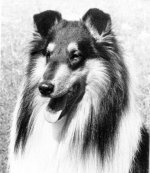 If you are interested in learning more about collies for mobility and support, please contact us. We’d love to hear from you and answer your questions! Mal and Leo are one of the most recent Teams to complete Team Training and graduate. Barbara and Cosby completed their training in 2011. 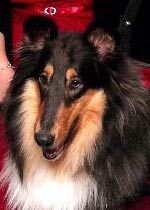 Cosby is a full brother of Brynn and Barry whose pictures and stories you can see below. Read Cosby’s story and watch his video. Karen and Sammy are the happy 2010 graduates. 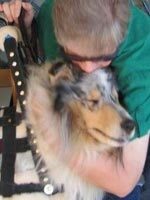 Brynn is Scott C.‘s third service dog. Read Brynn’s story, as told by Scott’s partner Jenny. Barry works with a young boy on the autistic spectrum who needs support. Plus, he’s an excellent dog for the entire family. Andy works with Devin in some challenging, busy environments. He has learned her cues and supports her through her workday, allowing her to lead a normal life with a busy job. Watch for Myah & Winston’s story! Watch for K. & Gabe’s story! Watch for Fred & Sean’s story! 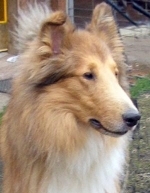 Stasha served as Shiela’s next mobility collie after Sega retired. Stasha helps Shiela with the ongoing balance and stamina issues she has due to relapsing-remitting multiple sclerosis, and the two can go almost anywhere together. Read how Stasha assisted Shiela in Yellowstone National Park. Read another story about how Stasha helped Shiela on vacation. 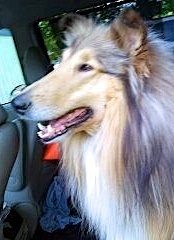 Ramsey was Scott C.‘s second service dog. Read Ramsey’s story, as told by Scott’s partner Jenny. Meet Cindy P., writer and editor (ret. 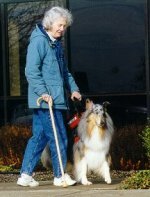 ), and busy retiree, and her service dog “Sera,” Kings Valley Seraphina, HS, TC, CGC, TDI, ptd. Read Sera’s story, as told by Cindy. Blondie’s granddaughter, Kings Valley Silhouette, HIC, TC, called “Silly,” kissing her beloved new partner, 12-year-old Meghla of beautiful Washington state. 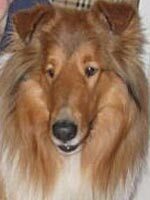 Select’s great-grandson, Kings Valley Advise ‘N’Consent, HC, TC, called “Lion” is partnered with Scott C., who suffered a massive stroke which derailed his plans for a career in law. Read Lion’s story, as told by Scott’s partner Jenny. 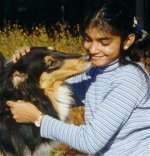 In preparation for Blessing’s retirement at age 9, Shiela was introduced to the young dog who would eventually follow in Blessing’s footsteps. His name: Champion Gambit’s When Stars Collide, aka Sega. 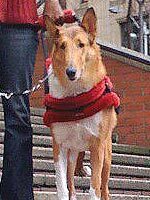 Shiela and Sega completed their team training in November 1998 and Sega cheerfully assumed his role as Shiela’s service dog partner, allowing Blessing the luxury of a life of leisure as Mike and Shiela’s family companion. See more photos of Sega and Shiela. 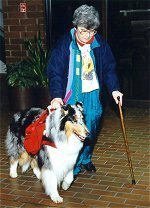 Diagnosed with multiple sclerosis at the age of 37, Shiela read about service dogs in the MS Newsletter and through the Delta Society, and learned about Kings Valley Collies’ Service Dog program. 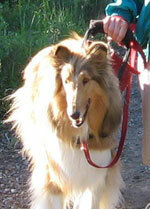 Shiela partnered with Kings Valley Blessing, HC, TC, CGC, TDI, BPDX, VC, Service Dog (retired). Read Blessing’s story, as told by Shiela. Read a news story about Shiela and Blessing. 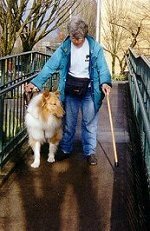 Select’s daughter, Kings Valley Choice Vintage, HC, TC, TDI, CGC, CRT, BPDX, VC, Service Dog “Blondie” first assisted a young quadraplegic man and later, a woman with spina bifida. In her retirement, Blondie fine-tuned her skills and streamlined her appearance. 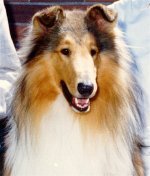 She died in 2001, at age 13, peacefully and fulfilled.